« Traffic lights? We don’t need no stinking traffic lights! traffic psychology: pseudoscience or mere quackery? 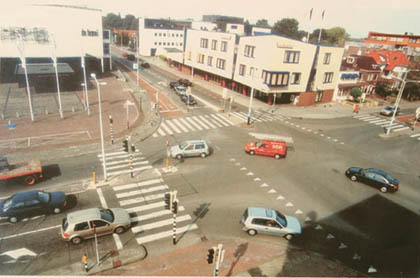 Evidence for the effect of the Naked Streets comes to us from the mouth of Dutch traffic engineer [traffic engineer? pseudoscience or mere quackery?–ed.] Hans Monderman, whom we met the other day at Toronto’s Walk 21 conference. We sent our ill-reputed correspondent, Jacob Allderdice, who had official capacity as presentor of a “Walkshop” called “Life at the speed of a Bicycle,” in which he took conference delegates to experience Toronto’s mysterious Danforth Peninsula. We have examined Allderdice’s theories on the Danforth elsewhere, and will return to his claims at a later point [no doubt; now, let’s get to the naked part already! –ed.]. Naked Streets are the talk of the town these days. 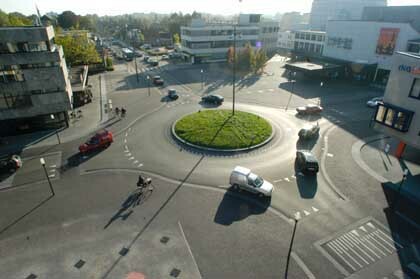 In fact, we described the German town of Bohmte in a previous entry, and noted the existence of a couple “naked” intersections we know of here in Toronto. But coupled with the delight Toronto feels when the eyes of the world turn to it (“Toronto: The Bilbao of Canada,” as the PR flacks would have it) (rejected slogan: “You like me, you really like me!” was felt to be too obscure), the presence of Hans Monderman in Toronto these past few days has brought the notion of naked streets to front pages of the local papers. Monderman was quoted today in “A radical road map: no signs, no lights, no rules,” a lengthy feature article in Toronto’s Globe and Mail and Car Advertiser. Naked streets, a.k.a. “shared space,” are streets stripped of legalistic information like speed limits, stop signs and stoplights, and even delineation between sidewalk and roadway. They leave cars, bikes and pedestrians to stew in ethical and moral choice at every turn of the wheel, and every footfall. The intent is that each street, each intersection, each vista, present to the participant a question, not an answer. The effect is a substantial reduction: in speed of traffic; number of collisions; severity of injuries from collisions; and, most surprisingly, a reduction in overall time spent in transit from A to B. It used to take cars roughly half an hour to travel across the city. Now, although traffic moves more slowly, the trip takes about 10 minutes. This means cars don’t idle in traffic jams as often – steady engines are quieter and use less gas. Yes, under conditions of Naked Streets, it appears the time spent crossing town is lowered, even while the average speed of a typical motor vehicle is also lowered. In other words, flow is improved; stoppages eliminated. Cars spend less time idling, as well as less time speeding. Leon James, a University of Hawaii researcher and one of the world’s most prominent traffic psychologists, doubts that Mr. Monderman’s designs would work on most North American roads. Traffic Psychology? We don’t need no stinkin’ traffic psychologists. Also: “Motorists are antisocial” and “Motorists are subconsciously homicidal.” See the link above for the substantiation to these claims. The pedestrian leads generally a more positive existence than that of the motorist. The pedestrian is, after all, out in society interacting with other human beings, without the distancing effect of metal armour. But pedestrians are seriously psychologically dysfunctional, and these dysfunctions stem from their self-loathing. Unlike the motorist, however, the pedestrian is not homicidal. Rather, the pedestrian prefers to enact beatings and maimings, and does not require the need for the certainty of killing power (unless, of course, the pedestrian goes on to become a motorist). The archetype of the pedestrian is the street thug. Pedestrians, if they are not already in a street gang, are sad, frustrated people itching to join one. This entry was posted on Saturday, October 6th, 2007 at 6:57 pm	and is filed under A Question of Urban Design. You can follow any responses to this entry through the RSS 2.0 feed. You can leave a response, or trackback from your own site.